(using optional Outrigger accessory). Using our unique DVR™ technology, the direct drive motor is incredibly smooth with no pulleys or belts to vibrate. 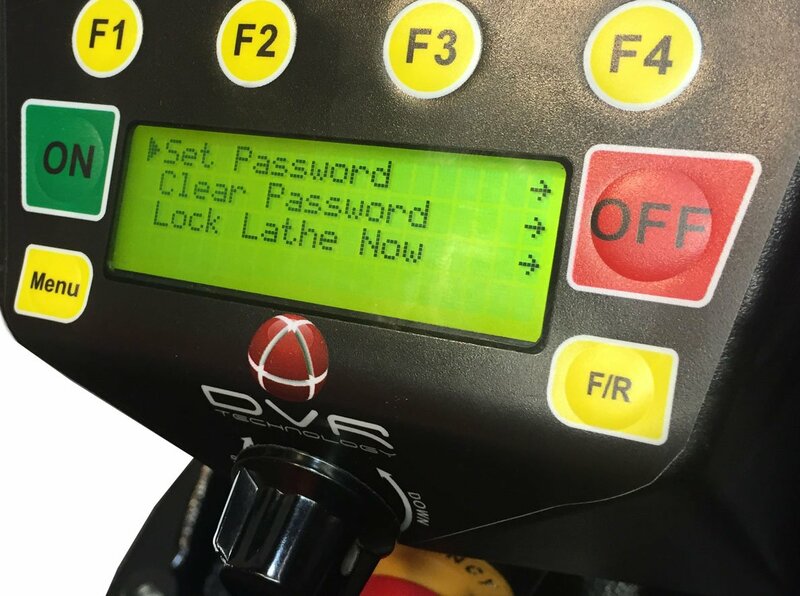 The DVR™ series from NOVA is the only smart lathe series available on the market, and the ONLY lathe to feature intelligent ADAPTIVE CONTROL™ software that works for the turner to produce optimum turning conditions for your specific projects. Combines the best cutting edge features (power, capacity, and capability) of larger lathes with proven state of the art technology. Makes your turning more enjoyable while turning more efficiently and safer. 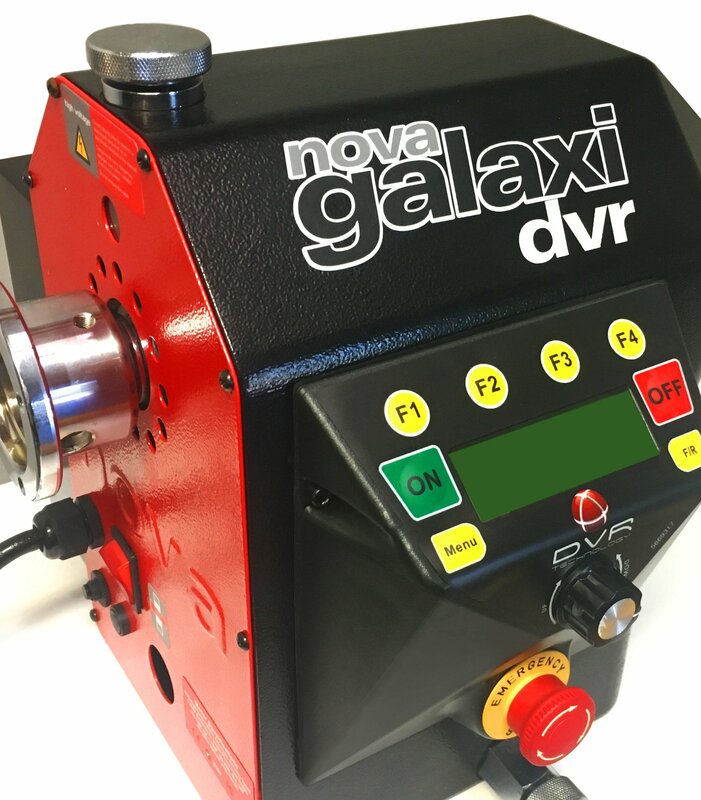 The NOVA Galaxi DVR™ is the most versatile lathe on the market – able to handle a wide range of work from small pens to large 29″/750mm bowls to long spindle work (using optional Outrigger accessory). With it’s unique DVR™ technology, the direct drive motor is incredibly smooth with no pulleys or belts to vibrate or change. This versatile lathe works for the turner to produce optimum turning conditions for your specific projects. Headstock can slide along to the bed to provide a maximum bowl turning capacity from the end of the bed. (expandable to 29” capacity outboard with optional outrigger accessory and 44” between centers). 2HP (220v) and 1.75 (115v) Direct Drive DVR™ Motor offers more power/torque than any competitive 16″ lathe on the market. Favorite Speed feature enables you to program your most used speeds for efficient project setup. Exclusive larger design with CAD-designed ribbing for structural strength and a provision for a tool shelf. Designed to allow for custom shelves to add to the stand. Shelves are not supplied with the stand. Great for those who need all the space they can get! The swivel head and articulated Outrigger Accessory (additional purchase) means that even when turning large bowls, you are still turning in the same compact space. Slide the headstock along the bed for larger projects. Position work where you want it makes your turning more comfortable and saves space. Perfect for a wide variety of projects from small pens to large bowls and platters. Delivers high torque right from the start – making it well suited for low-speed turning. No belts to change – full power output is available at the spindle. The computer analyzes (100s of time per second) both the spindle position and the power required to maintain a given speed. As cutting tool pressure is increased the drive adds more power. The DVR™ is a simple motor – the complexity is in the electronics. It has few mechanical parts with no belts, pulleys – the motor and lathe headstock are a fully integrated whole. There are no brushes or magnets and only one set of very robust industrial grade stator windings. Upgraded to the 1644 lathe from a Midi and I am extremely pleased with its performance so far. Tech support has been very responsive and helpful in answering all of my questions I had during setup. Topping the list of pros for me is the swivel headstock to aide in hollowing bowls. The speed set point being displayed prior to start up is a safety feature in my books as I had experienced some surprise high speed starts on my old lathe. Very smooth and quiet operation. Torque is very impressive at all speeds. Speed selection options are impressive between favourites, dial coarse/fine adjusting and selecting right from the speed chart pretty clever. 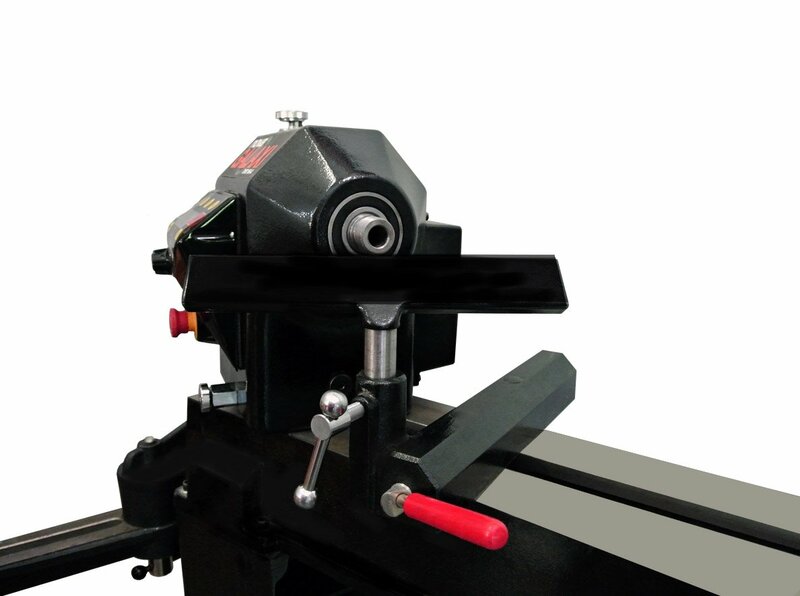 Electronic brake is adaptive adjusting to speed and weight of the workpiece. I look forward to several years of turning enjoyment from this lathe. Acruline alignment tool is a must have. I bought my Galaxi at the woodturners symposium at a fantastic price and they even threw in a free remote. I can’t say enough about the great customer service from this company. The lathe came wired for plugging in to 110 outlet and I thought when I got it home I would really want to change it over to the 220 to gain the extra 1/4 horsepower but have not done so yet it seems to have plenty of power for even the larger bowls. I love many of the extra features on this lathe, my favorite being able to turn the headstock so I can look into the bowl without bending over the lathe to see whats going on as I turn inside. I also have purchased some of the extras, one I would recommend for everyone would be the alignment tool. Thanks Technatool for the thinking out of the box & please keep coming up with the innovating ideas. Do not buy this lathe, you will never get anything else done because you will fall in love with this machine. All I want to do is turn and I have never like turning except a few pen’s and knobs for thing I had built. Now I take crappy wood and old firewood and make great things. I’ve owned my Nova Galaxi for a bit over a year, upgraded from a Nova DVR XP, which I had for 9 years. I like my DVR XP a lot and got great use of it. I LOVE my Galaxi, sliding headstock, choice of button or know speed control. VERY beefy cast iron absorbs vibration. It’s a great lathe and joy to use. Thank you Nova for so many great products! Absolutely no affiliation, I just appreciate quality, value and great customer service. 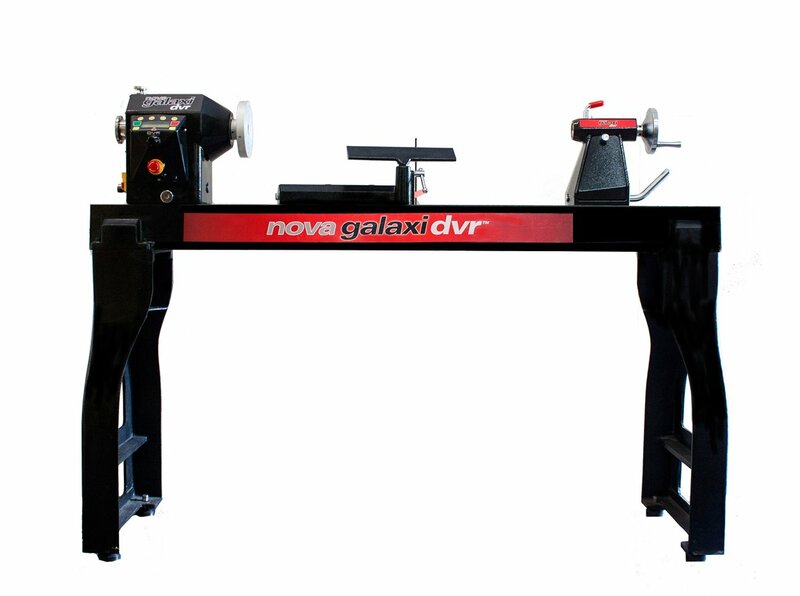 Have owned two other lathes which worked fine until I discovered the Nova Galaxi DVR. Have had so much more enjoyment in turning and am willing to try new wood products on this lathe. I feel this is the lathe of the future with features that other turners wish they had. Was introduced to an older model Nova which has now been upgraded and now have to say we are in competition for best work. Visit striatech.com to read more about the intelligent motor features they can add to your lathe.